Torn between pizza night and taco night? 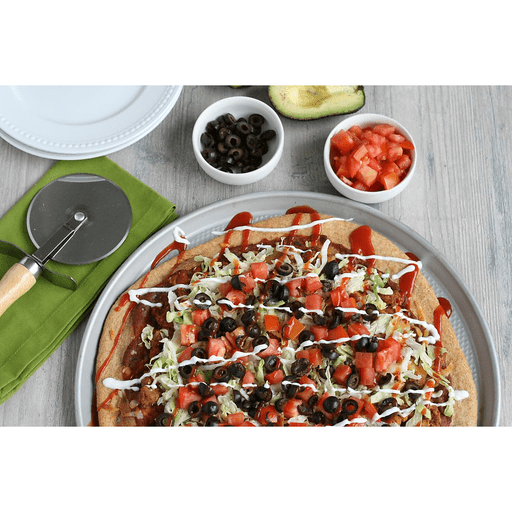 Have the best of both worlds with this delicious and easy Taco Pizza! We've topped this 'za with our favorite taco toppings, but feel free to top it with whatever your heart desires. 1. Preheat oven to 425°F. Spray pizza pan with cooking spray and set aside. 1. On a lightly floured surface, roll out pizza dough into a circle that fits the pizza pan. Place on prepared pan and brush edges with olive oil. Bake for 5-10 minutes and remove from oven. 1. In a small bowl, stir together the refried beans, taco sauce and pizza sauce. Spread sauce onto the pizza. 1. Cook ground beef in a large skillet over medium-high heat. Add taco seasoning according to package instructions. 1. Top pizza with taco meat and cheese. Bake until cheese has melted and crust is golden brown, about 10 minutes. 1. Remove pizza from the oven and top with shredded lettuce, chopped tomatoes and sliced black olives. Slice pizza and serve with salsa, taco sauce, sour cream and guacamole, if desired. Calories 430, Total Fat 15g (Saturated 5g, Trans 0g), Cholesterol 60mg, Sodium 960mg, Total Carbohydrate 45g (Dietary Fiber 3g, Sugars 4g), Protein 28g, Vitamin D 0%, Calcium 15%, Iron 20%, Potassium 10% *Nutritional values are an approximation. Actual nutritional values may vary due to preparation techniques, variations related to suppliers, regional and seasonal differences, or rounding.